Based on the book by Michael Foreman. DINOSAURS AND ALL THAT RUBBISH was commissioned by Howell’s School, Denbigh, Clwyd, North Wales, and first produced by the pupils of the school in 1986. 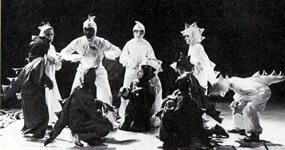 The play was subsequently presented by Whirligig Theatre at the Darlington Arts Centre, the Grand Theatre, Swansea and Sadler’s Wells Theatre, London in 1988. The play is popular with youth groups and schools. There have been several productions in the United States and Canada. Man destroys his own world through misuse and disrespect, only to search for a replacement in the stars. In his absence, the Dinosaurs return to Earth to discover desolation and destruction. In this humorous and intelligent story, the dancing Dinosaurs restore the Earth to its former beauty, with the help of the Animal Kingdom. Ironically, when Man returns, he tries to lay claim to the new, blooming planet he has discovered; but he is reminded that this is the same decaying Earth he had ruined and abandoned. The final song conveys the message that the Earth belongs to everyone and should be respected. The play’s running time is approximately 40 minutes. The first production employed a huge cast of children and musicians, all pupils of Howell’s School. The first professional production featured two professional actors, joined by approximately sixty children from local schools. 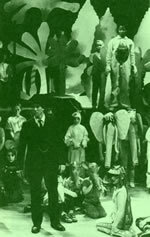 The children can be divided into separate groups, some becoming puppeteers, some the Workforce, others Dinosaurs, and others Flowers or Animals. Cast numbers can be varied to suit individual productions. “David Wood’s timely text was brought exuberantly to life by the Whirligig Theatre… a fable about the dangers of abusing the environment”. The play and piano/vocal score are published by Samuel French Ltd. The script is also published by Amber Lane Press. First Class Professional, Repertory & Foreign Rights : Casarotto Ramsay Ltd. UK Amateur Rights : Samuel French Ltd. US Stock and Amateur Rights: Samuel French Inc.